The book is divided into two complementary parts, the first on Programming and the second on Logic. Though they are both about logical reasoning, the first half concerns the ideas about programs that the reasoning is intended to capture, while the second half is more about the formal machinery. 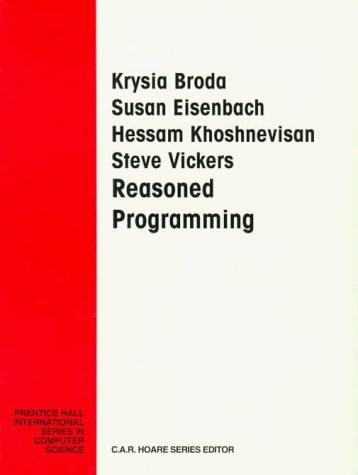 The distinction is somewhat analogous to that often seen in books about programming languages a first part is an introduction to programming using the language, and a second part is a formal report on it. To read the book from scratch, one would most likely read the two parts in parallel, and this is in fact how the material was used for the computer science course at Imperial College. However, the division into two reasonably disjoint parts means that people who already have some background in logic can see the programming story told without interruption. This book give an introduction to parts of proof theory and related aspects of type theory relevant for the Curry-Howard isomorphism. It can serve as an introduction to any or both of typed lambda-calculus and intuitionistic logic. The book teaches how to program by employing the tools of abstraction and modularity. The central philosophy is that programming is the task of breaking large problems into small ones. You will learn how to program and how to think about programming.